If you're looking for a hybrid that can provide you with a versatile driving experience, take a look at the Audi A3 Sportback E-Tron at Audi Allentown. This unique vehicle is a popular compact plug-in hybrid that's built with performance in mind. It has three distinct driving modes. The main mode that most drivers in Allentown will use is the Hybrid mode. It automatically switches between the two power sources to give you the best performance possible. The car will choose between the gasoline engine and the electric motor based on your performance needs. The next mode is Battery Hold mode. It's similar to the standard Hybrid mode. However, it preserves battery power for later use. Finally, there's EV mode. This is great for short drives. 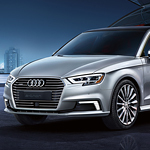 The A3 Sportback E-Tron will run entirely on the electric motor and battery power. In this mode, the car can still reach speeds up to 80 MPH, so you won't have to sacrifice performance on your drive.